F1 Circuit Ready to Go! This weekend, Valencia’s new F1 Track will be inaugurated, during the Spanish Formula 3 and GT Open. Saturday will be a day of practice, and 20,000 spectators are expected to turn up on Sunday for the races. With tickets for August’s Formula 1 race selling for hundreds and hundreds of euros, these inaugural races offer a more affordable way (€20) to see the track in action. As far as I’m concerned, fast cars are fast cars. I don’t actually know if there are any tickets left, but they’re being sold at El Corte Ingles. Anyone who knows for sure should feel free to leave a comment! 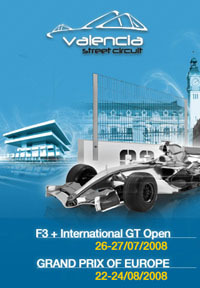 There’s a lot more information about the races and the track at the Valencia Street Circuit website.